New colour format - includes audio CD! 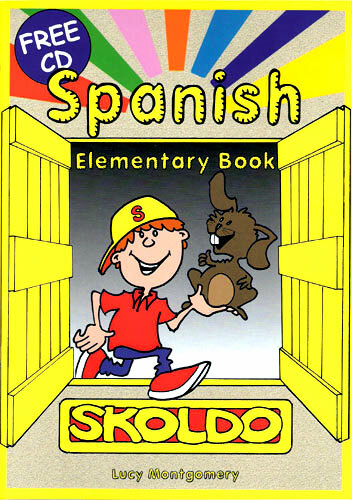 Ideal for use at home or in school, Skoldo is a popular introductory Spanish course for young children. Skoldo Elementary Book is a colourful activity book suitable for ages 4 - 7(Key Stage 1). It contains 140 words to learn through simple activities and pictures to colour. There are also 15 songs, including popular Spanish children's favourites such as "Los pollitos" and "Mi cara". The included accompanying CD covers pronunciation of all of the words, songs and games. Skoldo Elementary Book is suitable for early language learning. The level of language used in this book is fairly simple and each Spanish word is accompanied by an illustration when introduced for the first time. Parents wishing to use this book with their child would benefit from having a little knowledge of Spanish but this is not essential as words are introduced on the audio CD and most of the simple written instructions are translated into English when used for the first time. A complete English / Spanish vocabulary list is provided at the back of the book.